Atlantic City is a city in New Jersey, United States. It officially became a city in 1854. Atlantic City is an internationally renowned resort city for gambling, conventions, and leisure. The city also served as the inspiration for the original version of the board game Monopoly. Atlantic City is on Absecon Island on the coast of the Atlantic Ocean. As of the 2010 United States Census[update], the city has a population of 39,558. 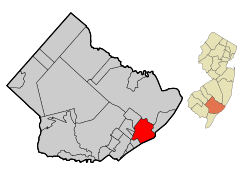 There were 274,549 people living in the Atlantic City–Hammonton Metropolitan Statistical Area as of the 2010 Census. The three road routes into Atlantic City are the Black Horse Pike/Harding Highway (US 322/40), White Horse Pike (US 30), and the Atlantic City Expressway. Atlantic City is roughly 132 miles (212 km) south of New York City by road (via the Garden State Parkway), 55 miles (89 km) southeast of Philadelphia. A railroad also connects to Philadelphia. ↑ 3.0 3.1 3.2 Gazetteer of New Jersey Places, United States Census Bureau. Accessed Accessed October 18, 2012. ↑ 5.0 5.1 DP-1 - Profile of General Population and Housing Characteristics: 2010 for Atlantic City city, Atlantic County, New Jersey, United States Census Bureau. Accessed January 12, 2012. ↑ 6.0 6.1 Table DP-1. Profile of General Demographic Characteristics: 2010 for Atlantic City city, New Jersey Department of Labor and Workforce Development. Accessed January 12, 2012. ↑ 7.0 7.1 GCT-PH1 Population, Housing Units, Area, and Density: 2010 - State -- County Subdivision from the 2010 Census Summary File 1 for New Jersey, United States Census Bureau. Accessed December 11, 2012. ↑ Look Up a ZIP Code for Atlantic City,NJ, United States Postal Service. Accessed January 12, 2012. ↑ DP-1 - Profile of General Population and Housing Characteristics: 2010 for Atlantic City-Hammonton, NJ Metro Area; New Jersey, United States Census Bureau. Accessed January 12, 2012. ↑ Maps & Directions, City of Atlantic City. Accessed February 4, 2012. This page was last changed on 25 May 2018, at 20:57.